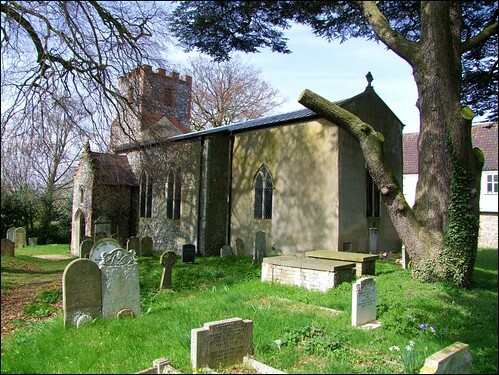 St Mary is a non-identical twin to round-towered St Andrew at Colney, half a mile or so further up the Earlham Road. Both sit to the north of the traffic, looking rather beleaguered and, apparently, helpless in the hollow of an unarmorial age. But I had just come from friendly Colney, where I had found the church to be warm and welcoming, obviously well-loved and very well cared for. I was hoping for something similar here. How disappointing. Earlham church is set opposite beautiful Earlham Park, beloved of generations of Norwich citizens, and not far from the main entrance to the campus of the University of East Anglia with its nationally important Sainsbury Arts Centre. Thousands of people must pass this church every day. And yet it is kept locked without a keyholder, and sulks miserably in its unkempt churchyard, a feeling of shabbiness and abandonment beginning to take hold. I could see a noticeboard up behind the grill, and, thinking it might give details of the key, I strode with some optimism up the path. But, behind the padlock, it turned out to be a sign telling you who to contact to discuss the possibility of getting married in the church. I could not think of anything less enticing, or anything more likely to tip people into choosing a secular ceremony instead. Mortlock makes the interior sound quite interesting, if appropriately gloomy: there is a surviving late medieval screen stained dark brown, and even a western gallery - it must feel quite cramped inside. This was one of the churches of the Gurney and Bacon families, and their memorials and hatchments can be found inside, apparently. I wandered around to the north side of the church. The buildings fronting the graveyard were a reminder that this was a rural place once. I thought about phoning the wedding line, just in case there was a chance of a contact number for someone who could let me see inside. Perhaps I could even pretend that I wanted to get married. But in truth, Earlham church's gloominess was beginning to take hold of me, and so I left, heading on to friendly St Thomas further into town.